Guide to taxis in Naples from the airport and train station to the ferry and hydrofoil ports. We've included prices between the major destinations and estimated journey times. 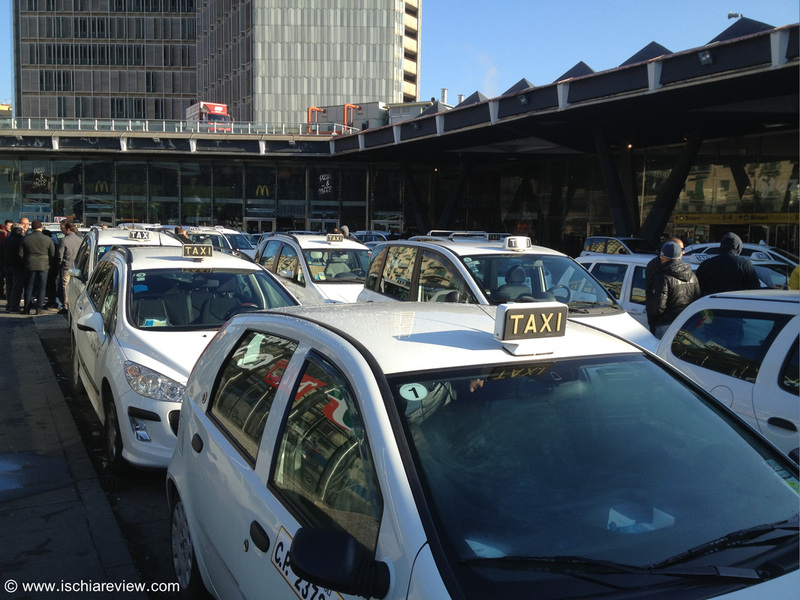 It's possible to take taxis from either Capodichino airport or from Stazione Centrale in Piazza Garibaldi. From the airport to the port you should expect to pay around €19 plus €2 per suitcase. Journey times are approximately 20-25 minutes depending on traffic. From Stazione Centrale train station you should expect to pay €12 plus €2 per suitcase. Journey times are approximately 15 minutes depending on traffic. Always ask for "Tassametro" which means "on the meter" to avoid paying extra and also to avoid disagreement with the driver. Never accept a ride from any taxi that doesn't have the official "Taxi" sign on the roof. Tipping is not strictly necessary and is at your own discretion. Below is a link to the official Naples taxi service website. The site is written in both English and Italian and shows information about fares between every major destination in the city (although at present the English version doesn't show the fare between the airport and Beverello port so use the Italian version for confirmation if required).